In the world of deck building, there is no better lumber than ipe wood. 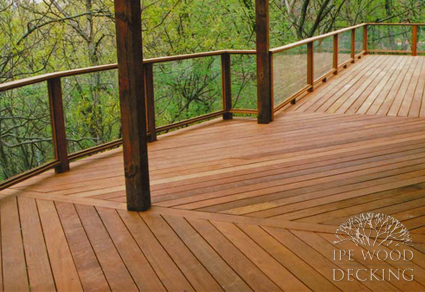 Also known as Brazilian walnut, this exceptional lumber is an exotic hardwood from the forests of Brazil, and its rich shades of red and brown make beautiful decks. Yet, believe it or not, the deep colors and subtle grain patterns, as beautiful as they are, are the least of the reasons for you to choose it. Growing up in the unforgiving ecosystem of the South American rainforest, ipe trees must develop defenses against nightmarish insects and moisture-loving bacteria. When brought out of that hard environment and into the peaceful setting of your backyard, these defenses will create a long-lasting retreat that you can enjoy with minimal maintenance. With so many reasons to choose this incredible lumber, what are you waiting for? If money is a concern, check out our pricing page to see just how affordable our lumber is. When you want to order your new deck, fill out our online contact form or give us a call!